Well I nearly wrote 23rd December then, I know the weather is bloody rubbish but I don’t think it’s that bad. I was going to be lazy with this and just serve the corn cobs at the side but Mr S convinced me otherwise and I’m glad he did. Boil the potatoes for five minutes then drain and set aside. Get a griddle pan up high and add the corn cobs. You want them to char so turn regularly. Once charred all over, strip the kernels. 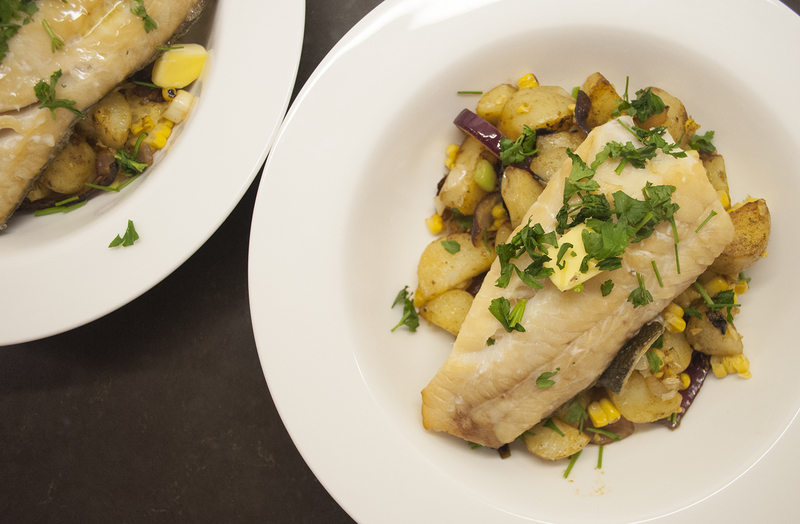 Pop the haddock in a roasting dish, drizzle with a little oil and cook for around 15 minutes. Heat some oil in a pan and cook the red onion and garlic until softened. Add the potatoes and paprika, stir well then let the potatoes cook, stirring only occasionally. Add the corn and spring onions to warm through. Serve with the fish on top of the hash with a knob of butter and a sprinkle of parsley. This recipe can be found on the Cook M & S app. Looks like a perfect summer meal!